Europe has a 10-6 lead entering the final day after winning three foursome matches and halving a fourth. 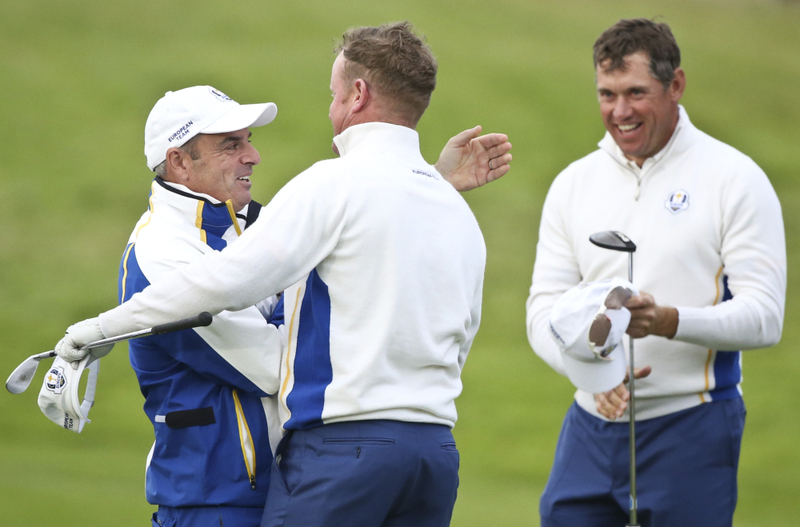 GLENEAGLES, Scotland — It’s 10-6 going into the final day of the Ryder Cup – again. This time, Europe’s in the lead and it’s the United States needing a stunning Sunday comeback. Two years after the “Miracle of Medinah,” where Europe overcome a 10-6 deficit to win 141/2-131/2, the home team leads by the same score after dominating the foursomes matches at Gleneagles on Saturday. But Europe, too, know what it’s like to throw away a 10-6 lead. Back in 1999 in Brookline, the U.S. overturned that same margin to win 141/2-131/2. Europe, which has captured seven of the last nine Ryder Cups, needs four points from Sunday’s 12 singles to retain the trophy and 41/2 points to win it outright. Europe captain Paul McGinley warned his players against complacency, saying they can’t afford to lose any momentum on Sunday. U.S. captain Tom Watson said his team was up to the challenge. “As I recall, there’s been a little bit of history with 10-6 comebacks. The players are already talking about that,” he said. “I have a trust in my players that they can get it done. They know absolutely what they have to do. The captains took opposite approaches to Sunday’s singles order. Looking for an early spark, Watson put his three youngest players at the top of the order, leading off with 21-year-old rookie Jordan Spieth, followed by 24-year old rookie Patrick Reed and 25-year-old Rickie Fowler. McGinley, meanwhile, front-loaded his lineup with established veterans. Out first will be former U.S. Open champion Graeme McDowell, followed by Henrik Stenson and No. 1-ranked Rory McIlroy. McGinley said he picked McDowell to play the first match because he’s a “real fighter” who can set the tone. McGinley is sending out his youngest player – 24-year-old rookie Victor Dubuisson – to play the final match. Dubuisson, who has won both of his foursomes, will face Zach Johnson. McGinley was asked if Watson was taking a risk by putting his rookies out first. Saturday’s play began with Europe leading 5-3. 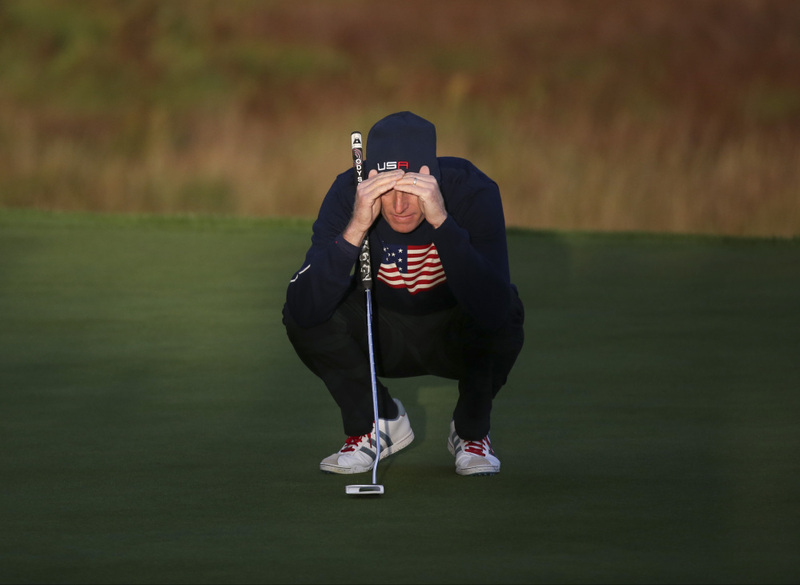 The United States won 21/2 points in the morning fourballs to cut the lead to 61/2-51/2. The Europeans seized command in the afternoon, winning three of the alternate-shot matches and halving the fourth. It was the second day in a row Europe grabbed 31/2 points from the foursomes. Lee Westwood and rookie Jamie Donaldson got the ball rolling, beating Zach Johnson and Matt Kuchar 2 and 1 in the first foursomes. Then, McDowell and Dubuisson extended the lead to 81/2-51/2, beating Fowler and Jimmy Walker 5 and 4. Fowler remains without a win in his Ryder Cup career. The third win of the afternoon came from McIlroy and Garcia, who defeated Jim Furyk and Hunter Mahan 3 and 2. It was the marquee duo’s first win in three matches after two halves. In the final match, Justin Rose and Martin Kaymer halved with Spieth and Reed. With the Americans 1-up going to the final hole, Europe got up and down from a greenside bunker. Rose holed a 5-foot birdie putt to earn the half point. The morning session featured a record-breaking performance by Rose and Stenson, who finished with 10 straight birdies to beat Bubba Watson and Kuchar 3 and 2. The European duo’s 12-under score was a Ryder Cup record in fourballs. The 21-under total for the two pairings was also a record. Left out of both sessions was Phil Mickelson, marking the first time the American has been omitted from an entire day’s play in 10 Ryder Cups.